Pay no mind to those bone-chilling sounds of terror and anguish coming from the lab of Emory psychologist Harold Gouzoules. He’s harvesting screams. He gets the sounds from Hollywood movies, TV shows and YouTube videos. His collection includes classic performances by “scream queens” like Jaime Lee Curtis and Fay Wray, along with the screams of non-actors reacting to actual events. “It seems everything these days is recorded and shared,” Gouzoules says. As one of the few scientists researching human screams, he’s amassed an impressive library of high-intensity, visceral sounds. In one of his clips, a woman shrieks in fear as aftershocks from the meteor that exploded over Russia shake a building. Another of his YouTube finds is a little girl’s prolonged, ear-splitting squeal of delight as she opens a Christmas present. “The ability to belt out a scream is deeply rooted in our evolutionary history, and is no doubt critical to our survival,” he says. 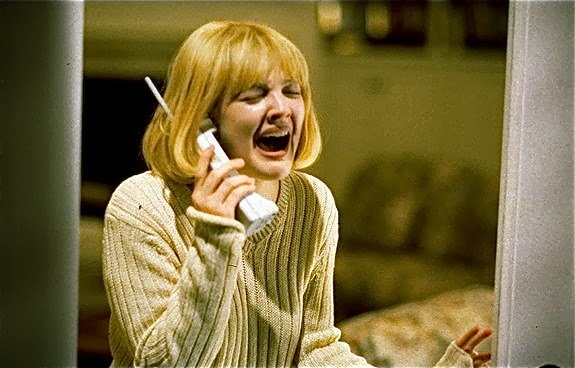 Actress Drew Barrymore in Wes Craven's original "Scream." Gouzoules first began researching monkey screams, decades ago. He learned that, during fights, rhesus monkeys make particular screams depending on the situation. The different screams communicate to the screamer’s nearby relatives and allies whether it’s a serious fight, requiring their assistance, or just a minor squabble. More recently, Gouzoules began studying human screams. Study participants come to his “scream lab” and listen to various audio files on a computer, without any visual cues for context. The preliminary results show that participants tend to agree on what sounds should be classified as a scream, as opposed to a moan or a yell. In addition, most participants tend to be good at telling whether different screams come from the same person. Despite our fascination with screams, science knows relatively little about them. Gouzoules is honing in on tone, pitch and frequency to try and uncover the hidden patterns and complexities carried in the most intense sounds of human terror, joy and pain. It would be interesting to see a study regarding why girls scream more than boys. My observation is that girls scream when they are playing even though there is no danger or pain involved.